Campgrounds visited include Port St. Joe Peninsula State Park, O'Leno State Park, and Anastasia Island. Throughout its more than 30-year plus history, The Magnolia School has developed and come to cherish many student-centered traditions. These traditions enrich our community, and by participating in them—often with their own styles—our students, families, staff and teachers consciously create the culture that is The Magnolia School. Our traditions make us unique, and represent our best in terms of creativity, connectivity, and living with great love and joy. Twice a year, in the fall and the spring, the community sponsors a camping trip for students and their families. These trips are usually coordinated with the current theme students are studying. These trips are great learning experiences and provide excellent opportunities for bonding between the students and between families. The last day of school is usually a few days before the last day of public school. We have our last field trip to Silver Lake on this day. Graduates usually have their parent’s coordinate to rent (and pay for) a limo to transport them to Silver Lake. The children go swimming and share in a potluck meal. Graduates make a wish list of foods they would like to have and parents sign up to bring food. After lunch is the graduation ceremony. Students get “pied” by their fellow students (only those who choose to participate!). Those who do the pieing qualify through participation in TV Turn-Off Week. The entire Magnolia community makes a tunnel by touching hands and the graduates run through and jump in the lake. At that point the graduation is officially over and we go back to the school. As part of graduation, students and their families get together to decide on a parting gift for the school community to enjoy in future years. 5th and 8th grade graduates are "pie-d" after the ceremony, and then all in attendance form a hand bridge underneath which the graduates run to wash off in Silver Lake. Magnolia parents and students alike get in the spirit of the Halloween Tunnel! Every year we have a Halloween party. This party is usually on a Saturday night and includes a pot luck dinner. After the dinner, parents volunteer to work carnival type games for the children to play and earn prizes (also donated by parents). The highlight for this event is the Halloween Tunnel. Children create a spooky tunnel out of very large pieces of cardboard, lots of duct tape, paint and whatever their imagination desires. Former students attending high school can earn community service credits by helping on the tunnel during weekends and afternoons. 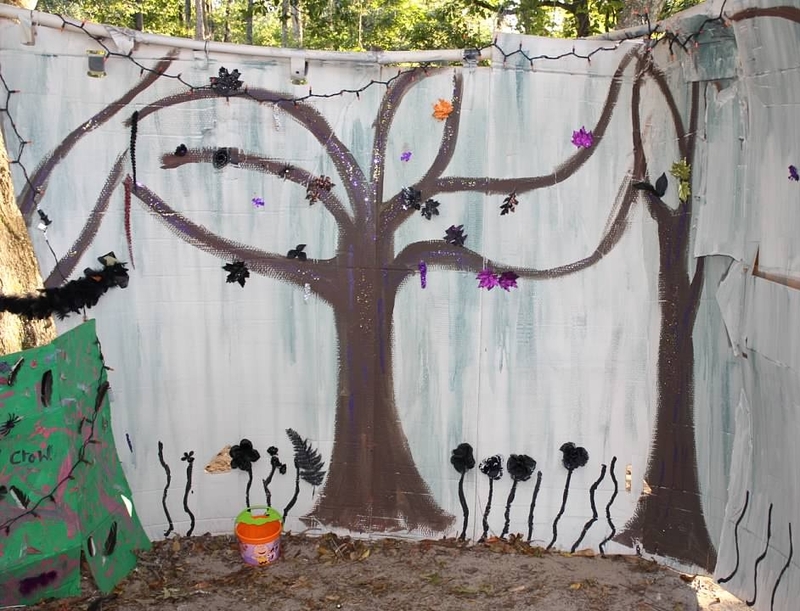 The Halloween Tunnel & Party culminates at dusk with the opening of the tunnel, where different students create their own “rooms” that reflect their personalities (and their tolerance for scary things!). The tunnel stays up after the party for the children to play in during playground time. The Magnolia School middle-school students and many of their parents travel to the North Georgia foothills for a week of learning, camping and fun at the Earthskills Rendezvous, a program that teaches sustainable living, strengthens our connection to nature, and illustrates the power of community. In daytime workshops, the students learn traditional crafts and textiles, plant identification and more from expert instructors. The art of making a camp fire without matches is a favorite. Evenings around a fire circle are filled with music, storytelling and games, and the students return with journals full of their experiences, many of which are published in the school's newsletter. Rendevous week is always a wonderful opportunity for our students to grow in self confidence and self reliance, and to bond as a group. Walk around the grounds of the school and you’ll notice lots of decorative stepping stones. Each year, eighth-grade graduates make a stepping stone to leave at the school. The project is very similar to completing a thesis or a doctoral program: The students choose something they want to know about that is challenging, and they do what it takes to achieve that challenge, document the process, and present it to the larger community. If students can successfully meet these criteria, they have acquired the skills most valued by Magnolia.